NOTE: The latest iOS 11 prevents Keynote from working with remotes. Older iOS version will still work. For those who need to make presentations on the road, Keynote for iPad has been a blessing. Apple has done a tremendous job of streamlining the process of putting presentations together in the iPad version, while maintaining most of the vital functions of the desktop version of Keynote. While the app provides the user with the ability to create easily, the delivery of the presentation has been finger-centric at best. By finger-centric, I mean that you still need to touch and swipe the screen to advance slides within Keynote for iPad. There are few things more annoying than watching a presenter locked in position in front of his MacBook pressing arrow keys to change slides. The need for finger swipes keeps the iPad user locked in the same presentation dilemma as his laptop counterpart. And while there is an iPhone app to remotely control Keynote presentations, holding a phone while walking around on stage looks amateurish at best. In addition, the iPhone app is dependent on existing WiFi networks to connect to the iPad as a controller. If you don't have a reliable WiFi signal in your presentation space, then you're out of luck with that option. 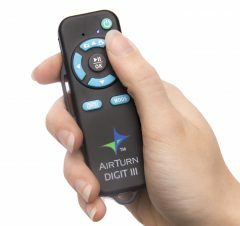 A better option is the AirTurn DIGIT III, a tiny remote that's small enough to fit on a keychain, making it a perfect accessory for the bulk-conscious globetrotter. While there are lots of handheld remote options for the desktop version of Keynote, the DIGIT III happens to be one of the only remote of its kind to be able to control Keynote for iPad specifically (it also happens to be able to control the desktop version as well). And since it operates using Bluetooth, there's no need for WiFi - the DIGIT III communicates directly and wirelessly with the iPad. If you love the portability of Keynote for iPad but miss the freedom of remote presentation with the desktop version, then check out the DIGIT III.